Yesterday morning I read an article in our local newspaper why so many Americans don’t use their vacation days. So let me try to paraphrase it in my own words. You’ve probably heard already that U.S. workers do not take a lot of vacation days during the year, mainly due to the fact that they don’t get a lot. There’s no mandatory amount of paid days off, that companies have to comply with. So it’s not unusual that employers only give you 5 days of paid vacation annually, if you just started working for them (like me back in 2007). You may get more vacation days the longer you’ve worked for the same company, but it’s really up to their own company policy and what they are willing to give you. Sometimes it’s negotiable when you’re in the process of being hired. This chart is “minimum” paid vacation days only. If you get more vacation than mentioned here, it’s thanks to your employer. 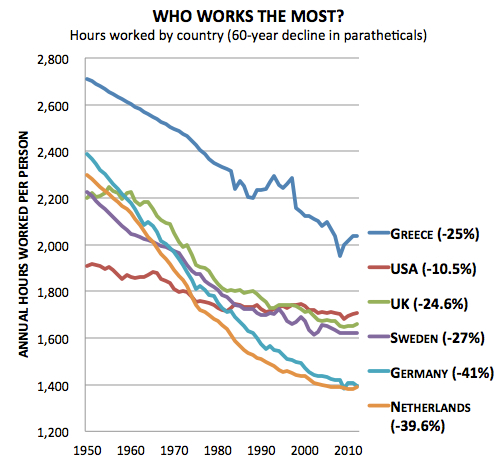 Now you might think that Americans would take full advantage of the little time off that they get from their employers. Think again! According to the U.S. Travel Association, 40 percentage of all Americans don’t take all of their vacation, leaving 430 million days of unused paid vacation a year. For a travel-loving German like me, this is shocking!! I’m not sure how many of my co-workers don’t use all of their vacation. I only remember one person who regularly didn’t use 2 or 3 days a year due to workload and I kept asking him if he would like to donate these days to me. Unfortunately, that was never an option. So why in the world would you not use the few days that you get to see the world, get some quality time with your family or just enjoy life outside of work? Some people have, very similar to older generations in Japan, this whole busyness as a badge of honor thing. The less vacation days they use, the more committed they are to their employer and company goals. They call it honor, I call it workaholics. Honor is just one reason for people not to take their deserved time off. The most common reason is thinking to be indispensable and that nobody else can do their work. And if co-workers can do their work, they are afraid that they could easily be replaced. Maybe it’s because some don’t want their co-workers to see how little they actually have to do every day, so they want to protect their pretend workload to keep their well paid position and avoid any extra work (just my evil assumption). One third said that they cannot afford to be on vacation, probably due to workload rather than money, since it’s “paid vacation time”. That’s when work becomes more important than family or life in general. I could see how becoming replaceable would make employees fearful. In this country it’s just way too easy to fire people, so employees are very careful, especially if they depend on this job. Labor unions are just not that common here like it is in Europe. But this is a whole different debate with many pros and cons. Another reason that was mentioned in an article of the Charlotte Observer was, that employees don’t like to return to a pile of work after their vacation and therefore rather don’t go on vacation to begin with. Reading all this makes me understand why so many vacation packages in the USA are only for 3-5 days, while in Europe it’s common to book 1-, 2- or even 3-week packages. For me it’s almost not worth the hassle to pack my suitcase for a 3-day vacation, but I’m slowly getting there (3-day Bermuda Trip article coming soon!). And it’s not that these 3-day vacations would be super cheap. It costs just as much as a 1-week vacation in Europe. You see, as an employer, there not a huge pressure coming from the employees for more paid vacation days. Americans seem to be happy with what they get and some don’t even use all of it. So why bother giving them more and cut into profits? To not give you a false impression of American employers in general, let me tell you that there are also American companies who give their employees a decent amount of vacation days and also encourage a good work-life-balance. After 7 years at my current employer, I now get 23 paid days off annually, which is a fair amount. 3 more years and I’m up to 28 days, which is only 2 days less than what I got in Germany. I hope you enjoyed this little insight into the American work-life-balance or lack thereof, speaking for 40% of the American workforce. Personally, I do not know anybody who would rather work than spend a few paid days off, so this was as surprising to me as it is for you. If you’re working in the U.S., please share how many paid vacation days you get each year and how many you are actually using? Please comment below. I freelanced and while I sometimes craved the stability a normal 9-5 job would provide for me, I placed high value on being able to take time off whenever I wanted.